The dining room table is the focal point for many family gatherings and sets the tone for those events. Replacing an old or outdated table with a new, fresh design can create a modern look in the dining room and may even serve as the starting point for a complete interior design makeover. Selecting the right dining room table is the first step in this process and one of the most crucial. A number of factors should be considered in the decision including the space available for the table, any existing interior dÃ©cor, budget considerations, the number of people to be seated, and the tastes of the owners. Many modern dining tables can be expanded to add extra room for more guests; typically, this involves adding a leaf or two to wooden tables or raising a drop-leaf for metal or composite table designs. This added flexibility can transform an intimate family area into the perfect formal dining venue with only a few moments of work. Japanese influences have been more and more prevalent in the modern furniture design world. One sleek, classic example of this is the Tokyo Modern Dining Table by Italian furniture designer Tonin Casa; this elegant glass-top table is available in sizes to fit nearly any area and features a lacquer base supporting a sturdy glass tabletop. The glass is available in a variety of tints from the classic clear glass to frosted, black, champagne, and white hues to suit any dÃ©cor. Sizes include standard fixed 63-, 71- and 79-inch widths as well as extendable models that start at 63 inches and can be configured to expand to a full 118 inches of dining space. The classic base is available in champagne, aluminum, black, and white to complement the glass top. This table goes well with a variety of chair types and colors and adds a modern, minimalist look to the overall interior design of the dining area. It goes best with simple, clean lines and black and white or bright primary colors due to the stark lines and strong statement delivered by this stunning piece. For a more traditional look, the Louvre Designer Dining Table combines leather and glass into a table reminiscent of classic styles but with a modern edge all its own. Designed and manufactured by Tonin Casa in Italy, the table consists of a tempered glass top on a leather base with four leather-tufted upholstered legs. Available in fifteen different colors, the luxurious leather upholstery adds a touch of opulence to any gathering and is perfectly complemented by the matching Paloma Dining Chairs, also by Tonin Casa. 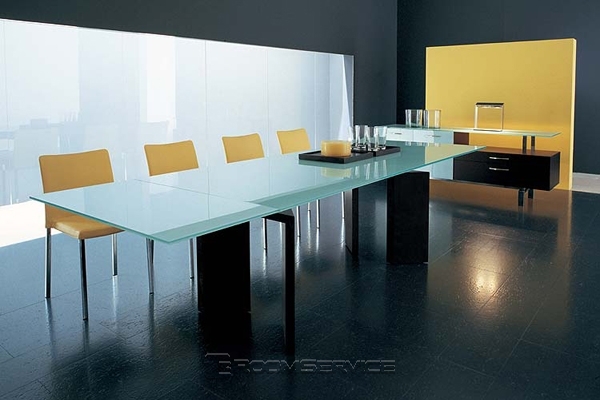 The tempered glass tabletop is available in black, white or champagne tints or in a transparent finish. Three fixed widths and three expandable models offer maximum flexibility and can provide as much as 118 inches of length in this versatile and impressive dining table. The Louvre table will complement nearly any theme, but is especially suited to complement French provincial or baroque dÃ©cor. 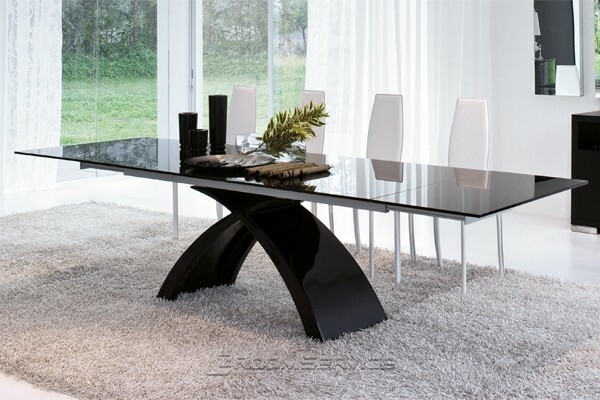 The Zoar Modern Dining Table from Tonin Casa provides consumers with a look at the future of Italian furniture; this sleek piece of contemporary interior design art features angular legs connected by a chrome connecting mechanism. A modern classic of minimalist design, the Zoar tempered glass tabletop is available in transparent, frosted, black and brown finishes and can be paired with light oak, cherry or wenge legs for a completely customized look. The table can be configured in one of three fixed widths or three expandable models for greater versatility; this table is perfectly suited to hyper-modern and minimalist design due to its streamlined, modernistic appearance. These three dining tables demonstrate the impact of a single piece of furniture in determining the overall design themes of a room. Italian designers like Tonin Casa are setting trends and creating new paradigms in home design. By planning a redecorating project around solid pieces like the three highlighted here, homeowners can invest in lasting beauty and classic style.